Honda Motor (China) Investment Co., Ltd. announced that Honda today held a ceremony in Guangzhou, China, to commemorate the start of demonstration testing of its electric vehicles (EVs). The tests will be conducted jointly with the government of the city of Guangzhou and Guangzhou Automobile Group Co., Ltd. The ceremony was attended by Mr. Xin Gan, vice mayor of Guangzhou representing the city of Guangzhou; representative of Guangzhou Automobile Group; as well as Honda executives including Seiji Kuraishi, Chief Operating Officer for regional operations in China, and Chitoshi Yokota, executive in charge of Business Unit No. 2, Automobile Operations. Honda also disclosed for the first time the base for the vehicles to be used in the demonstration testing. For this demonstration testing, Honda's EVs will be driven in a real-world urban transportation environment in the city of Guangzhou to verify the practical convenience of EVs and identify technological issues needed to be addressed to achieve the widespread use of EVs in the future. In addition, proposals regarding re-charging infrastructure will be made based on the results of the EV range verification and other relevant information. 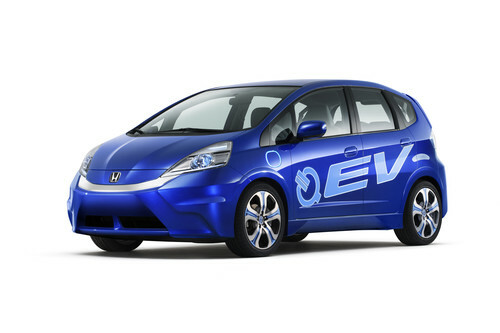 Moreover, Guangqi Honda Automobile Co., Ltd. is aiming to begin local production of EVs in China before the end of 2012. The vehicles to be used for this demonstration testing is the Honda Fit EV (vehicle for demonstration testing only), which is equipped with electromotive technologies, such as coaxial motors, Honda amassed through development of the Honda FCX Clarity advanced fuel cell electric vehicle as well as the advanced lithium-ion battery. The charging time of Fit EV is under six hours with a 220V power supply and the range is more than 150km.